I came across this amazing post about becoming a mother to a child with Down syndrome. I have read many interpretations of how it feels and although some are close they are just not always spot on. We all have our own stories and we all have our own emotions tied to the day of the diagnosis. After only a year on this journey I have learned some great lessons. The most important lesson learned is not to feel guilty about the way I felt then, I am here and I am RIGHT NOW and I am in an amazing place with God, my family and with Down syndrome. My life changed one summer day in June and thank God it did. That first meeting with another family farther along the path of Down syndrome after the birth of our child with the same diagnosis. I remember fear and fascination. Fear of the child four or five years old who’s eyes mirrored my baby’s. She shouldn’t have looked like him. I birthed her. She should have resembled me. Fascination, as I watched his sister play with him; he hit her, she cried, mother reprimanded. So common, so usual, so family. Things I thought we may have lost with the appearance of an extra chromosome. I cried quietly for two hours while visiting this dear little boy and his family. They loved him. They cherished him. He played games, and communicated with his hands and with his voice. He chowed down on his lunch. But still, I cried, because this path wasn’t my choice. At my point of weakness his mother appeared strong. I was an anthill. She, a mountain. I clutched my baby to my chest, each second teetering between relief and uncertainty. Her smiling eyes met mine. But that day I did not love Down syndrome. It was too big, too unknown. Your husband contaced us last week. We scheduled dinner. The following days you kept popping up in my mind. A mother forced to move from a typical parenting landscape to some place new, a place everyone claimed was special. If you are anything like me, shocked by a culture wildly unknown and unsolicied. Several responses queued on my tongue. Instead, in a brief moment of clarity, understanding that Elaina would learn more from the truth, I responded. Your family arrived. We cooed over both of your children. I held your new baby in my arms. He smelled like sunshine. His eyes mirrored my daughter’s. I held your little one to my chest as our children played close by. Polly hit Zoya. Zoya cried which made Evie cry, and Elaina played on the floor with your son. You probably aren’t excited to be a part of our special needs club. I have to tell you, though, welcoming you into my home was like welcoming family. I am a bit farther down your new path. Give yourself time to fall in love with your son, and to get used to Down syndrome. Breathe in his baby smell. Watch how his brother kisses the top of his head, how your husband gently puts him down to sleep, how your baby locks eyes with you when he eats. The weight of the world is in those eyes. 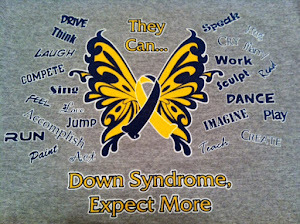 Today, you don’t have to love Down syndrome. Just love your son. Courtesy of an amazing mother who adopted a loving child from Reece's Rainbow Down Syndrome Adoption Ministry. You can follow her story at http://www.gillianmarchenko.com/. The mission of Reece's Rainbow is to rescue orphans with Down syndrome through the gift of adoption, to raise awareness for all of the children who are waiting in 25 countries around the world, and to raise funds as adoption grants that help adoptive families afford the high cost of adopting these beautiful children. Please show your support by visiting http://reecesrainbow.org/.